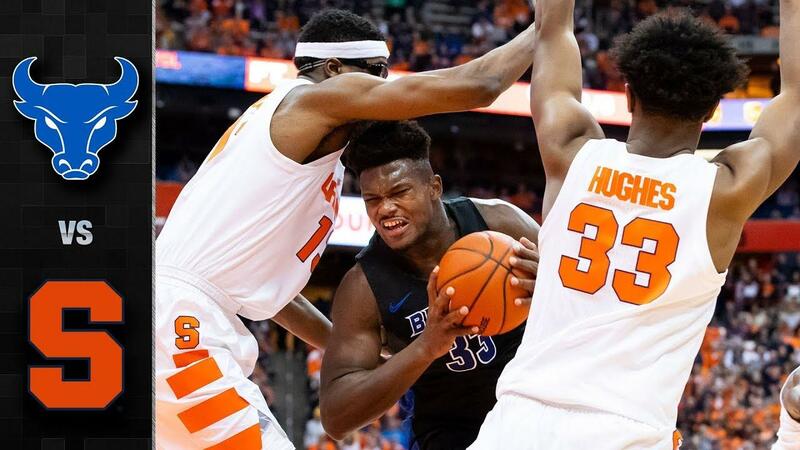 The #14 ranked Buffalo Bulls outscored Syracuse 39-23 in the second half on Tuesday night, allowing the Orange to shoot just 27.6% from floor as Buffalo defeated Syracuse, 71-69, in front of 18,260 people at the Carrier Dome. The victory over Syracuse was Buffalo’s first since 1963. UB remains undefeated on the season improving to 11-0. Buffalo outscored Syracuse 28-11 over the final 12:30 of the game as UB found its scoring touch in the second half, shooting 40% from three over the final 20 minutes of action. It was slow start for UB, who missed its first eight shots. While the Bulls never led in the first half, UB used some strong defense to keep the game close, heading into the half down just 36-32. Syracuse held a six-point lead with 12:21 left, but a layup from senior CJ Massinburg began a 16-5 UB run where the Bulls took the lead and never looked back. The Bulls hit back-to-back threes courtesy of seniors Montell McRae and Jeremy Harris, which gave the Bulls their first lead of the night at 50-48 with 9:40 left. With the game tied at 53-53, the Bulls scored five straight, including a driving layup from junior Davonta Jordanand an old fashioned three-point play by Massinburg. Syracuse pulled back within two with 4:25 left, but a huge Jordan three pointer ignited a quick 8-0 run, giving the Bulls the double-digit lead at 67-57 with 2:09 left. Syracuse scored just two points over the final 4:25 of action as the Bulls built their lead up to 12 points following a pair of Massinburg free throws, which would be the final margin of victory. Massinburg moved into fifth place on UB‘s all-time scoring list tonight as he had 25 points, eight rebounds, and five assists, playing nearly the entire game for the Bulls. Massinburg now has 1,519 points for his career. Harris added 18 points and six rebounds, while senior Nick Perkins had his second straight double-double with 10 points and 12 rebounds, including four huge offensive boards. Perkins moved into ninth place on UB‘s all-time scoring list with 1,393 career points, surpassing Louis Campbell. Jordan had 10 points, including a pair of three-pointers, while adding four rebounds, and four assists. McRae pulled down six rebounds to go along with his three points. As a team, the Bulls dominated the glass, holding a 48-35 edge in rebounding over the Orange. The Bulls will remain on the road with one more big contest ahead of them before the Christmas Break. Buffalo will head to #20 Marquette on Friday evening for a nationally televised game, which will tip at 8:30 pm ET on Fox Sports 1.